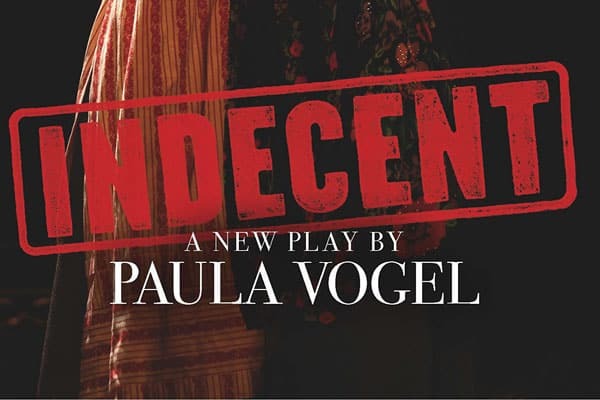 Paula Vogel‘s new play, Indecent, is a vivid, entertaining and melancholy page-turner. The characters pop-off the page, the themes are timely and the message, to stand up for the courage of your convictions, will leave you energized. Vogel, the Pulitzer prize-winning playwright of How I Learned to Drive, has constructed a play-within-a-play concept for her new work. It’s the true story of Sholem Asch’s controversial and groundbreaking play, God of Vengeance, which he wrote in 1906, about a Jewish brothel owner who bribes a rabbi so that his son could marry his daughter. The play features prostitutes, a Torah being throne and tossed aside and the first-ever lesbian kiss on a stage. After playing all over Europe, it had its Broadway debut in 1923. The play itself, tells the story of Asch, his work and the actors that performed it over the years. It creates a moving portrait, not only of the culture of the times but what it took to have a life in the arts. Early on, we meet Lemml, who now goes by his American name, Lou, as a young go-getter who will do anything to please his new boss, Asch. As the play progresses, he becomes integral to the play, eventually becoming the stage manager and a fierce advocate for the work, more so than Asch, who has now retreated to the safety and confines of his study in Staten Island. Asch is a different man towards the end of the show. Having visited Europe and seen firsthand the uprising against the Jews, he comes back to America defeated. He doesn’t want his work to add to the demonization of his people. When the play finally makes its Broadway debut – and the authorities shut it down and arrest the actors for obscenity – Asch won’t appear in court to defend it. It’s a moving and sad moment, particularly because it’s now the actors who have adopted this work and taken it to heart. The show, which ran on Broadway for 128 performances in 2017, received three Tony Award nominations, winning two of them.